You can grow either German chamomile or Roman (English) chamomile but they are not the same plant.German chamomile is an annual, and it grows in a bushy shrub up to 3 feet tall. On the other hand, Roman chamomile is a perennial that only gets about a foot high and tends to grow along the ground. Though both will produce very similar aromatic blossoms, it’s German chamomile that is the more commonly grown for its blossoms. Not very many insects will bother your chamomile plants, and they even repel cucumber beetles (so plant near the veggie garden). You do sometimes find clusters of tiny aphids on chamomile but they are not much of a threat. They are easy to spray off with the regular garden hose, or a little bit of insecticide spray can help control the bugs. Only use pesticides intended for fruits or vegetables, and don’t spray right before you intend to pick your flowers. German Chamomile is a herbaceous annual native plant to southern and western Europe as well as northern and western Asia. It should not be confused with Roman Chamomile, which is perennial. German Chamomile is hardy in USDA zones 5 to 8 (6). It grows best in full sun or light shade and can grow up to 3 feet tall. It should be planted in light sandy soil with good drainage and should be placed about eight inches apart. The plant requires occasional watering. 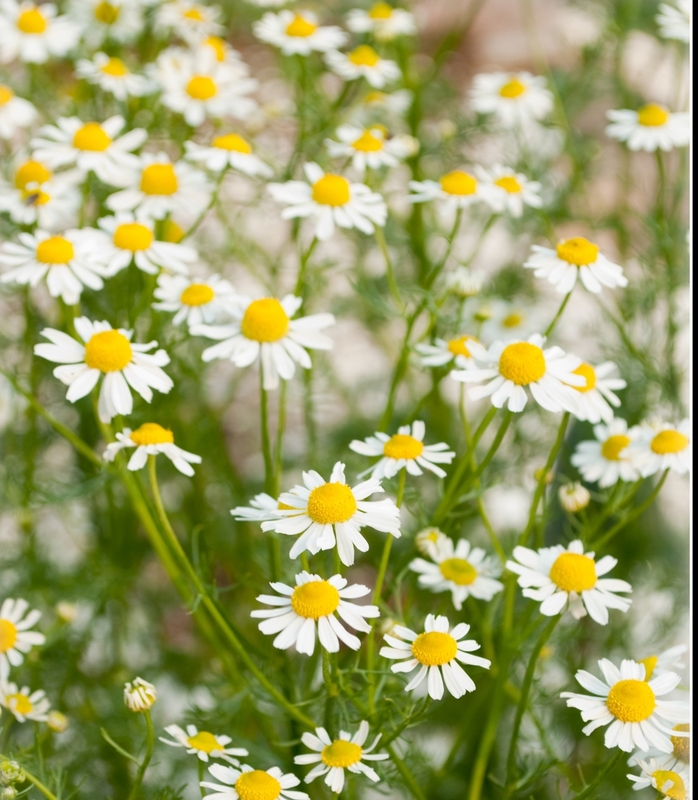 German Chamomile repels cucumber beetles and is recommended to be planted in vegetable gardens along with other companion plants. Not many insects bother the plant. Sometimes, clusters of aphids may be found, and they can be sprayed off with water or insecticide. Chamomile is commonly used as a medicinal plant for its anti-inflammatory, anti-bacterial, anti-allergenic, and sedative properties (1). German chamomile is a herb, and its flower heads have been used to made medicine. Medicinal ingredients have been extracted from the dry flowers using water, ethanol, or methanol as solvents and corresponding extracts known as aqueous, ethanolic (alcoholic) and/or methanolic extract (9). Research shows that taking 220-1110 mg of German chamomile capsules daily for 8 weeks can reduce anxiety and depression in adults (7). Many people in the United States take chamomile to relieve anxiety or help them sleep (8). In the past, chamomile had been used to treat stomach cramps, irritable bowel syndrome, indigestion, diarrhea, gas, and colic (8). Chamomile can be used in tea to treat lumbago, rheumatic problems, and rashes (3) It can also be used in a salve for hemorrhoids and wounds as well as a vapor to alleviate cold symptoms or asthma (3). Many cultures use it as a medicinal plant for its anti-inflammatory, anti-bacterial, anti-allergenic and sedative properties. German chamomile is native to Europe, North Africa, and some parts of Asia. It is closely related to the Roman chamomile, which has many of the same medicinal properties as German chamomile (8). Chamomile has been well-known throughout Egypt Greece, and Rome. its popularity grew through the Middle Age when people used it as a remedy for asthma, colic, fevers, inflammations, nausea, nervous complaints, children’s ailments, skin diseases, and cancer (9). Chamomile is often used in a cream or ointment to soothe irritated skin, especially in Europe (8). Chamomile is also used to naturally lighten hair. A strong chamomile tea is brewed should be used as a leave in treatment after shampooing. Chamomile flowers can also be used to make a yellow-brown fabric dye. Chamomile is one of the most popular herbal home remedies in Mexican and Puerto Rican cultures (10). Dried chamomile flower is an age-old medicinal drug known in ancient Egypt, Greece and Rome. Chamomile's popularity grew throughout the Middle Ages, when people turned to it as a remedy for numerous medical complaints including asthma, colic, fevers, inflammations, nausea, nervous complaints, children's ailments, skin diseases and cancer. As a popular remedy, it may be thought of as the European counterpart of ginseng. as a salve, be used for haemorrhoids and wounds. be used as a wash or compress for skin problems and inflammations, including inflammations of mucous tissue. promote general relaxation and relieve stress. Animal studies show that chamomile contains substances that act on the same parts of the brain and nervous system as anti-anxiety drugs. Never stop taking prescription medications, however, without consulting your doctor. control insomnia. Chamomile's mildly sedating and muscle-relaxing effects may help those who suffer from insomnia to fall asleep more easily. Treat diverticular disease, irritable bowel problems and various gastrointestinal complaints. Chamomile's reported anti-inflammatory and antispasmodic actions relax the smooth muscles lining the stomach and intestine. The herb may therefore help to relieve nausea, heartburn, and stress-related flatulence. It may also be useful in the treatment of diverticular disorders and inflammatory bowel conditions such as Crohn's disease. soothe skin rashes (including eczema), minor burns and sunburn. Used as a lotion or added in oil form to a cool bath, chamomile may ease the itching of eczema and other rashes and reduces skin inflammation. It may also speed healing and prevent bacterial infection. heal mouth sores and prevent gum disease. A chamomile mouthwash may help soothe mouth inflammations and keep gums healthy. reduce menstrual cramps. 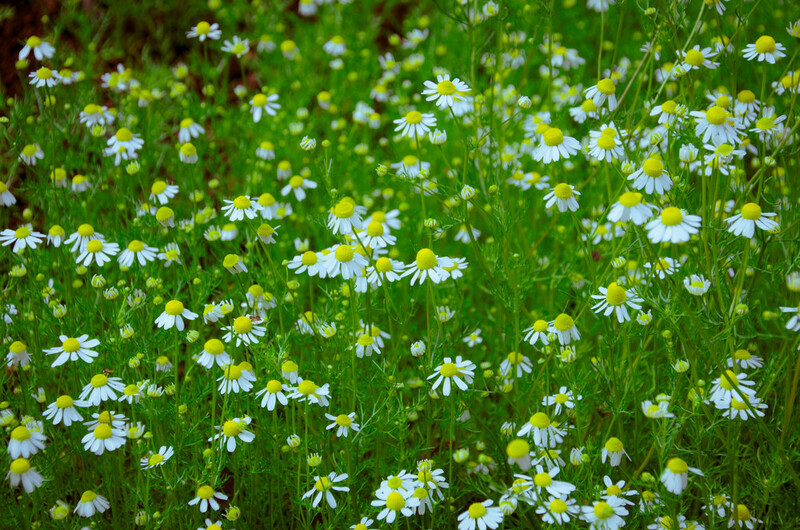 Chamomile's believed ability to relax the smooth muscles of the uterus helps ease the discomfort of menstrual cramping. Your plants can bloom all through the summer, so there isn’t any one specific harvest time. Most plants will start to put out flowers about a month after planting. Harvesting your chamomile flowers is a tedious task, but worth the effort. You only want the blossoms, not their stems which means you have to pick them quite carefully. Of course, you can always go through your chamomile after picking to remove any extra bits of stem later. You can use fresh flowers for tea, but it’s more typical to dry them before use. Spread them out somewhere warm and well-ventilated to thoroughly dry. Direct sunlight can harm the chamomile oils, so don’t just leave them out in the sun to dry. Indoors is usually best. Once dry, you can store chamomile flowers in a sealed container for a year. When making tea, you’ll need approximately 1 teaspoon of dried flowers per up. For brewing with fresh chamomile blossoms, use almost twice that. Add a little honey for sweetness. (1) McKay, D. L., Blumberg, J. B. 2006. “A Review of the Bioactivity and Potential Health Benefits of Chamomile Tea (Matricaria recutita L.).” Wiley Online Library. 2006. (2) "German Chamomile Production." June 1, 2009. (3) "Chamomile (Matricaria Recutita)." Chamomile Benefits & Information (Matricaria Recutita). http://www.herbwisdom.com/herb-chamomile.html. (4) "Herb, German Chamomile Organic | Seed Savers Exchange." Herb, German Chamomile Organic | Seed Savers Exchange. http://www.seedsavers.org/onlinestore/Herbs/Herb-Chamomile-German-OG.html. (5)"Traditional Medicinal Knowledge in Cuba." Google Books. http://books.google.com/books?hl=en&lr=&id=Kc5xrqAD9fYC&oi=fnd&pg=PA101&dq=chamomile cuba&ots=ZfEztH_Nql&sig=upQZoxqXbW8C6NvGevBtyfqNuEs#v=onepage&q=chamomile cuba&f=false. (6)"Matricaria Recutita/Chamomile, German Chamomile." Online Plant Guide. Accessed April 14, 2015. http://www.onlineplantguide.com/Plant-Details/4341/. (7)"Uses, Side Effects, Interactions and Warnings - WebMD." WebMD. Accessed April 14, 2015. http://www.webmd.com/vitamins-supplements/ingredientmono-951-german chamomile.aspx?activeingredientid=951&activeingredientname=german chamomile. 8. "German Chamomile." University of Maryland Medical Center. Accessed April 14, 2015. http://umm.edu/health/medical/altmed/herb/german-chamomile#ixzz3WXdLyRIh. 9. Srivastava, Janmejai, Eswar Shankar, and Sanjay Gupta. "Chamomile: A Herbal Medicine of the past with Bright Future." Molecular Medicine Reports. Accessed April 14, 2015. http://www.ncbi.nlm.nih.gov/pmc/articles/PMC2995283/. (10) "Chamomile Herbal History and Medicinal Properties : Asteraceae." Herbal Encyclopedia. December 22, 2010. Accessed April 14, 2015. http://www.cloverleaffarmherbs.com/chamomile/.